Its funny the way things work out sometimes, but last week I was whining because my mandatory start date for my new job was determined to be Monday, April 15 (Marathon Monday). (Incase you live under a rock, Marathon Monday is one of the funnest days of the year in the City of Boston). I thought about telling my new job that I already got approved for the day off from my old job, but instead I put my big girl pants on and actually decided to miss out on the fun this year. All I can do is Thank God that I was not in the City yesterday and pray for those that were affected by this horrific incident. My friends and family are all thankfully safe and one of my College Best Friends was able to successfully cross the finish line 2 minutes before the incident occurred. Glad you, your family and friends are safe. 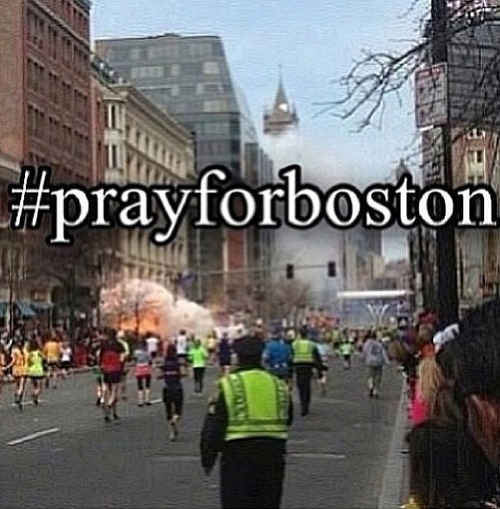 Such a sad and horrific thing to have happened.